2004 was the year the FAA (Federal Aviation Administration) reshaped the future of general aviation. That year they introduced the SPORT PILOT LICENSE category and the certification of SPECIAL LIGHT SPORT AIRCRAFT. The Sport Pilot License can be obtained in as little as 20 hours (FAA minimum) of flight training and the only medical certification required is a VALID U.S. DRIVERS LICENSE. Sport pilots are not obligated to pass the rigors of the FAA medical exam required of Private Pilots. 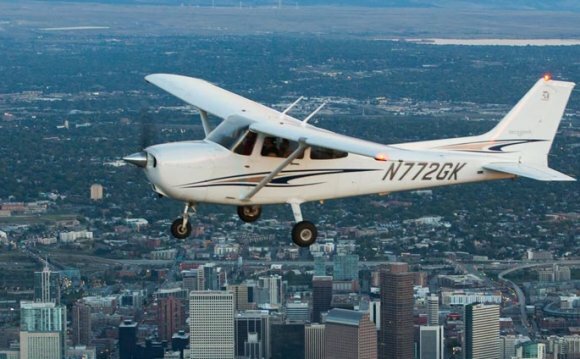 Half the flight training time of a private pilot certificate doesn’t make you any less of a pilot, but it does do what the FAA intended the Light Sport Certificate to do, and that is make realizing your dream of becoming a pilot MUCH MORE AFFORDABLE. How long will it take to get my Sport Pilot Certificate? The FAA requires a minimum of 20 hours of flight training to be eligible for certification. The time required can be as little as 2 weeks if you enroll in our accelerated training program but whether it’s weeks or months is up to you. Immerse yourself in flight instruction several times a week or spread it out over several months, the choice is yours. What are the steps to get my certificate? Prepare for the written test. From the first flight with your instructor you’ll need to study along the way in preparation for your written exam which is usually taken towards the end of you flight training. Dual Instruction. The majority of the hours flown in the beginning will be with a certified FAA flight instructor. During this time you will be introduced to maneuvers and skills required to develop into a proficient pilot. Acquire a student pilot certificate. Before you may engage in solo flight training you must obtain a Student Sport Pilot Certificate issued by the FAA. Solo Flight Training. When you are ready… Your instructor will set you free to make your first solo flight. During this phase of flight training you will go out on your own and fine tune your skills. During this period you will build the confidence necessary to become a proficient pilot. You will remember that first solo for the rest of your life! Cross Country Flight. Not as daunting as it sounds, but you will, with the supervision of your instructor, travel solo from your home airport to one or more airports and back home. These exercises will ensure your ability to fly and navigate safely. Oral and Practical Test. Once you meet all the flight training requirements and you instructor believes you are proficient… you are ready for you “checkride”. This check ride is composed of a oral examination and a hands-on flight in the aircraft with an FAA designated examiner. The check ride examines your knowledge, practices and proficiency at the contols of the aircraft. The FAA has a set of minimums required to gain a Sport Pilot certificate. We have found that most students will require slightly more training than the minimum requirements. The tables below will approximate the cost of a sport pilot certificate at the FAA minimums, and at an average that we at Zone Aviation have found to be accurate. What Other Expenses Will I Have? There will be other miscellaneous expenses associated with flight training. The largest additional expense you can expect is the cost to buy a pilot’s headset. A basic headset can be bought for around 150 dollars, with the most advanced headsets available costing nearly 1000 dollars. If you are unsure of what type you need, your instructor would be glad to assist you. You should also plan on spending some additional money on books, reference materials, and other supplies.